Bitcoin, which is one of the largest Cryptocurrencies all over the world, has become a lifeline for a tiny but growing community of users engulfed in serious conflict. These users are found in the two main Palestinian territories of both the West Bank and the Gaza Strip. According to one of the best financial analysts in that particular area, Ahmed Ismail, there are not less than twenty unofficial exchange hubs that are operated in those areas. These unofficial offices are mainly handling matters to do with Cryptocurrency to the local traders within that area. Mr. Ismail himself assists thirty traders who use the virtual coin to buy a number of international investments like stocks. This is because there are no local alternatives when it comes to placing money to work. 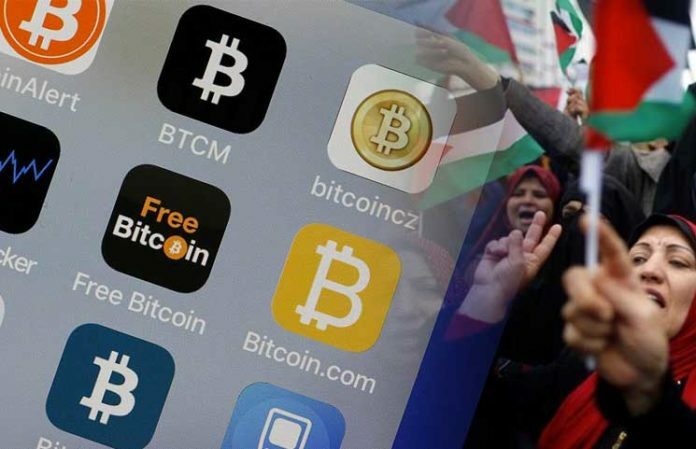 Moving to Gaza, there are also a number of currency dealers who assist traders to undertake various Cryptocurrency operations. One of them, referred to as Mohammed, as revealed that he normally assists up to fifty families in one month to make purchases that are related to Bitcoin. In a month, these families make purchases that are estimated to be around $500 of BTC. They mainly use this to either shop online or send money to families and friends who are abroad. According to testimonies given by these Palestinian families, Bitcoin is way much quicker, safer, and cheaper. Since nothing works with the banks in Palestine at the time of this great unrest, Bitcoin becomes the nest automatic banking institution. In the territories of the Palestine land, there is another major characteristic of the public Blockchain network that is gradually coming up, and that is censorship-resistance. Peer-to-peer Bitcoin operation can be carried out by any person. Once it has been paid for, there is no absolute way an intermediary can veto the transaction. This seems to offer a solution to the real problem facing a society that has restricted access to the international economy as its conflict with the Israelites continues. It can be remembered that even supporters of certain Western states had their accounts closed for just sending money to the war-torn Islamic state. Popular payment avenues such as PayPal are nowhere to be seen in Palestine. And, so traders who want to send or receive money to and from other countries all over the world. A solution on the Blockchain that applies the private nodes is the best solution for anyone who wants to send or receive cash abroad. Whereas it is a fact that sending and receiving BTC may be without any friction, there is no on and off ramps within Palestine. Since the major currencies that are used in this country such as the Israel Shekels, Jordanian dinars, and US dollars are not accepted in the Palestine local banks, Cryptocurrencies become the only solution. Therefore, they have to depend on the services of dealers as liquidity gateways to have their transactions undertaken. A tech worker from Palestine encountered what she had to undergo when she attempted to cash out a BTC payment from an employer. She was not able to get an average price from dealers in the area of Gaza due to the fact that the prices of virtual coins were on a great rise at that time.